Adolf Hitler’s Nazi party came to power in Germany in 1933 on a programme of public works, employment and restoring both national and personal pride. This included the systematic dismemberment of the ‘shameful’ Treaty of Versailles, which restricted Germany’s armed forces and her territory in Europe. Despite the bullying tactics of the Nazi Party’s paramilitary yobbos, the Sturmabteilung (the SA, precursors to the much more powerful Schutzstaffel, the SS), many in Germany at first ignored or disbelieved the more extreme, unpleasant and outrageous aspects of Hitler’s aims – though these were pretty clearly set out in his best-seller, Mein Kampf (‘My Struggle’). The British and French governments were primarily interested in avoiding a general European conflict. 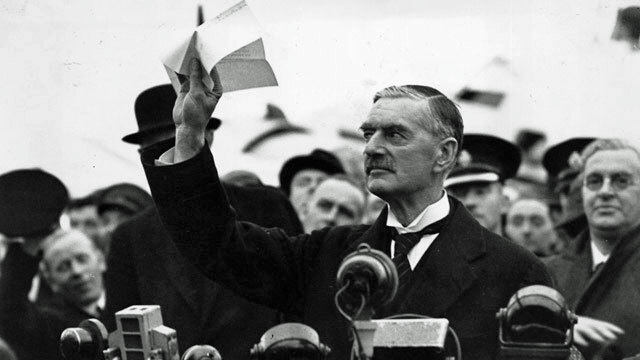 History finds it easy to mock the apparently naïve attempts of the British Prime Minister, Neville Chamberlain, to appease Chancellor Hitler. Chamberlain was a decent, civilised, man, used to dealing with like-minded people. Appeasers were in the majority in Britain, and elsewhere. With the benefit of hindsight, it is perhaps easy to accept that some, notably Winston Churchill, knew better; that Germany was rearming at an alarming rate, that Hitler was a bully and the only way to deal with bullies is to stand up to them. We know Churchill was right – but it’s not that simple. The fact is that, however inconvenient it may be to hear, at first there was some sympathy for some of Hitler’s policies – many people even admired them. And anyway, people said, weren’t the restrictions imposed on Germany after the Great War unfair? If Germany and Austria wanted to merge into one country, wasn’t that reasonable and in keeping with the principles of self-determination? It is an extreme step to interfere in the affairs of another country. Knowledge of the darker aspects of the Nazi regime was limited, and no normal person who had not experienced the brutal terror that was about to be unleashed on Europe could possibly imagine it. But a further critical factor was the memory of the First World War: the desire to avoid the slaughter being repeated and the consequent support for peace – whatever it cost – was widespread. Some believed that if this meant that Czechoslovakia lost a bit of land to Germany where the population was mostly German anyway (ignoring the fact that a good chunk of Czech industry went with it too, including the Skoda armaments works), did it really matter (unless you were Czech)? A very wise man who was in his 20s at the time (my father) once told me that his generation were the real peace generation, because they didn’t just talk about it. He went on to observe how quickly attitudes change once self-interest is more obviously threatened and the metaphorical bugles call. By the time of the Munich Agreement in 1938, a good many people (including members of my family) realised that Hitler was not a Good Thing for world peace, needed to be stopped and that war was probably inevitable. On 15 March 1939, German troops marched into the rest of Czechoslovakia. On the 1 September, Germany invaded Poland.